Stocks fell on Thursday after White House economic adviser Larry Kudlow said China and the U.S. were still far away on striking a trade deal, with the Dow Jones Industrial Average dropping by 360 points. Stocks fell to their lows of the day after CNBC reported that a meeting between President Donald Trump and Chinese President Xi Jinping is unlikely before a key March deadline. 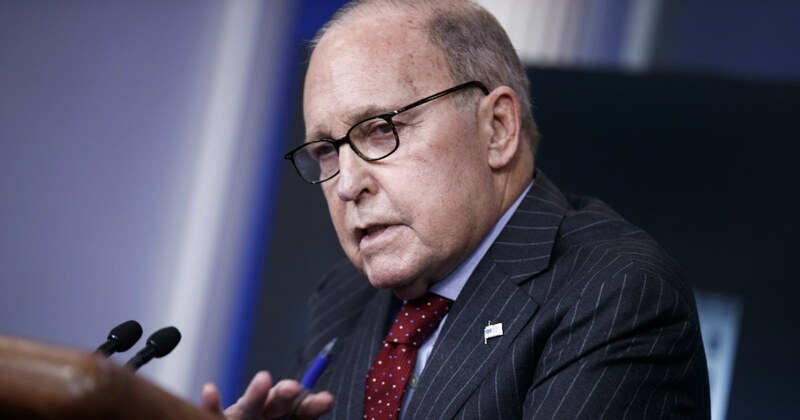 “We’ve got a pretty sizable distance to go here,” Kudlow told Fox Business, referring to the ongoing trade talks between the world’s two largest economies. China and the U.S. have until the start of March to strike a trade deal. Otherwise, additional tariffs on Chinese goods take effect. The market was already on edge as worries about the global economy were rekindled. Additionally, the European Commission slashed its growth outlook for the euro zone this year as it expects the bloc’s largest economies to be held back by global trade tensions, among other issues. The Commission said euro zone growth will slow to 1.3 percent this year from 1.9 percent in 2018, before rebounding in 2020 to 1.6 percent. That growth outlook sparked worries that the global economy could be slowing down. Similar fears contributed to the market’s sharp downturn in December. That decline briefly sent the S&P 500 into bear-market territory on an intraday basis. Thursday’s decline comes as the corporate earnings season continues. Twitter reported quarterly earnings that beat analyst expectations on Thursday. However, shares of the social media company fell 10.7 percent as Twitter also issued light guidance. Companies are reporting solid earnings growth for the fourth quarter with profits showing an increase of 14.1 percent on a year-over-year basis, according to Factset. However, the outlooks accompanying those earnings reports are not as rosy. Because of those poor forecasts, earnings for the first quarter of 2019 are expected to drop more than 1 percent, according to FactSet. That’s the first year-over-year decline in earnings in more than two years.